Cape Town – The problem with having such a cowed, horrendous first day’s play in a Test match is just how immense an effort is required to reverse the damage. South Africa were excellent on day two of the second Test against Australia ... yes, it was quite some fightback by the No 1-ranked side who appear to have woken from their relative tour slumber. Ordinary, a team mopping up the last five wickets of the opposition first innings for the addition of just 68 runs and then advancing to 217 for two themselves would be widely assumed to mean some sort of position of ascendancy. The Proteas’ admirable defiance and belligerence, though yet to give them the luxury of lifting a feeling of vulnerability, only demonstrated the extent to which they had been taken to the cleaners on Thursday. Still, South African supporters will happily bank small mercies, and the team could hardly have done more to begin to fix their damaged hull, in truth. Keeping them on the edge of their seats more than they would like is the infuriating way in which the tourists surrendered a well-set Alviro Petersen to a run-out and then the normally rock-like Hashim Amla shuffling down the track to inconsistent part-time bowler David Warner. Bearing in mind that the ability of injured Jacques Kallis to bat further down the order with any semblance of comfort remains a great and potentially crucial unknown, the Proteas have many miles yet to travel at the first-knock crease before they can claim security and serenity. As Morne Morkel, who began the Friday bounce-back with his salvo of wickets to clinch a five-wicket haul, pointed out at the post-play press conference, the oft-branded middle “moving day” may be instrumental in determining how this currently high-scoring, but swift-moving Test will pan out. 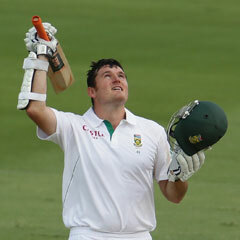 The first objectives are for Graeme Smith, the ever-scrapping South African captain who revels in adversity, to convert his already-posted 26th century into a significantly bigger one, and to collectively get past the follow-on avoidance target of 351 with a tidy cupboard of wickets still in reserve. From a very young age in the Test arena, the left-handed “Biff” got into a healthy little habit of kicking on once at the three-figure mark – his first four successive centuries at this level were amazingly 200, 151, 277 and 259. There has not been quite such extended weight to more recent tons, but Smith is also old and wise enough to realise that the Adelaide Oval pitch is offering desperately little to the faster men and may only do so as unevenness creeps in from the fourth day or thereabouts. If he can keep handling the off-spinner Nathan Lyon with aplomb, a significant extension to his vigil seems perfectly feasible. As it is, the hefty customer has already dragged his Test batting average just back over the 50-mark at 50.04, which is cause for additional satisfaction. For people who like to latch onto positive omens through statistics, it is a much-publicised fact that South Africa have not yet lost a Test where Smith has registered a century – even if Australians will be keener to venture that records are simply there to be broken. And those of superstitious nature will be either nervous or delighted, depending on their national affiliation, that Smith (111 not out) overnighted on the dreaded Nelson and with his team 333 runs still in arrears. It is the stuff that would have given late umpire David Shepherd nightmares. The skipper was being troubled by an old drawback, cramping, as the apparently sweltering Friday wore on, but he is the kind of figure who almost seems to get his motivation out of any additional hardship anyway.